Captain Gaetano Gigliotti of the Carnival Elation, along with his crew, has been recognized with the Exceptional Bravery at Sea Certificate of Commendation from the International Maritime Organization (IMO) for rescuing a stranded mariner from the dangers of last year’s category five hurricane, Hurricane Irma. “Every year, IMO honours and recognizes individuals who have contributed greatly to the objectives of the Organization, through their dedicated work and through exceptional acts of bravery at sea. Certificates of Commendation are awarded to nominees who have committed acts of extraordinary bravery. 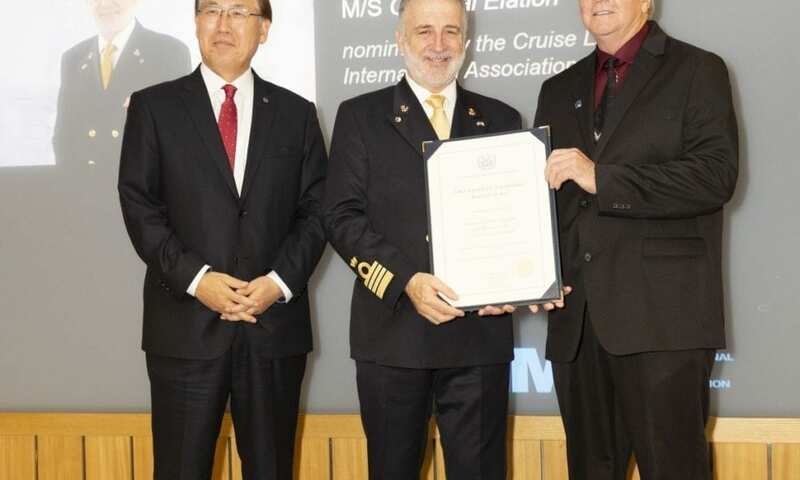 The Assessment Panel, the Panel of Judges and the IMO Council considered that the exceptional bravery displayed by Captain Gigliotti and the officers and crew of the passenger ship Carnival Elation merited the Certificate of Commendation, one of only three such certificates to be awarded this year,” said Mr. Fred Kenney, director, legal Affairs and external relations division, IMO and chair of the Assessment Panel. The Elation was actually headed away from the Bahamas (which faced severe devastation from Irma) to seek shelter in the Gulf of Mexico when they received a distress message from the U.S. Coast Guard regarding the stranded fishing boat. Even after the USCG informed Gigliotti they could no longer assist in the rescue effort, due to worsening weather conditions, he and his crew continued on through the twenty-foot waves to the boat’s side. When they got close enough, several crew members brought the mariner, Edward Potter of Tampa, Florida, on board using a harness and hoisting lines. The IMO is a specialized agency of the United Nations which serves as the global standard-setting authority for the safety, security and environmental performance of international shipping. They recognized Gigliotti and his crew at their annual conference in London, where survivor Potter also attended to express his gratitude.